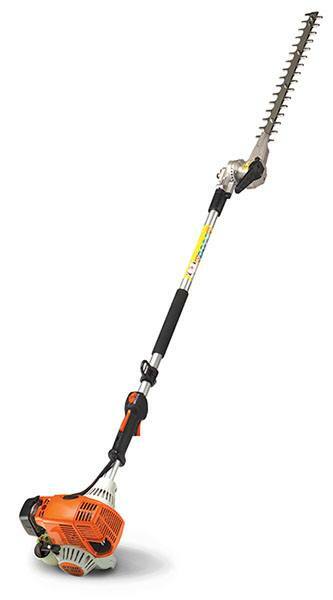 HL 100 K (135°) This adjustable-angle hedge trimmer has a 42” extended reach shaft, ideal for demanding trimming professionals. Every hedge is unique – which is quite a challenge when you’re trying to trim them. Whether tall or short, skinny or wide, hedges everywhere can’t escape the STIHL® HL 100 K (135°) extended reach hedge trimmer. With its 42 in. long shaft and adjustable cutting blade angles, this professional hedge trimmer helps turn those unruly hedges into uniform walls of green. And speaking of green, the HL 100 K features a low-emission engine for environmentally responsible hedge trimming. For power and versatility, this hedge trimmer has it all. ANTI-VIBRATION SYSTEM: STIHL has a system for minimizing the vibration levels of handheld outdoor power equipment. The STIHL anti-vibration system helps reduce operator fatigue and provides for a more comfortable working experience. Double-sided reciprocating blades with integrated cutter guard.